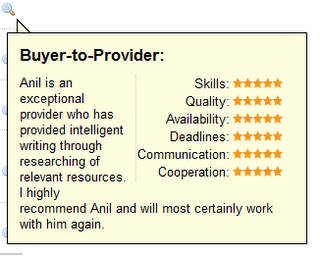 More than 10 clients on Elance.com, Guru.com and oDesk.com rated me 5 Stars. They prod me on to do better and improve. I thank them all for their encouragement. By the way I have to mention here that oDesk and Elance came together to become UpWork. Click on the images to see a larger picture to help you read comfortably. Please feel free to click here contact me. Thank you. Testimonial for Sales and Marketing Email content. A great feeling of having won in a fair competetion! Thank you Celina for stopping by. Will ask my guys to check it out.